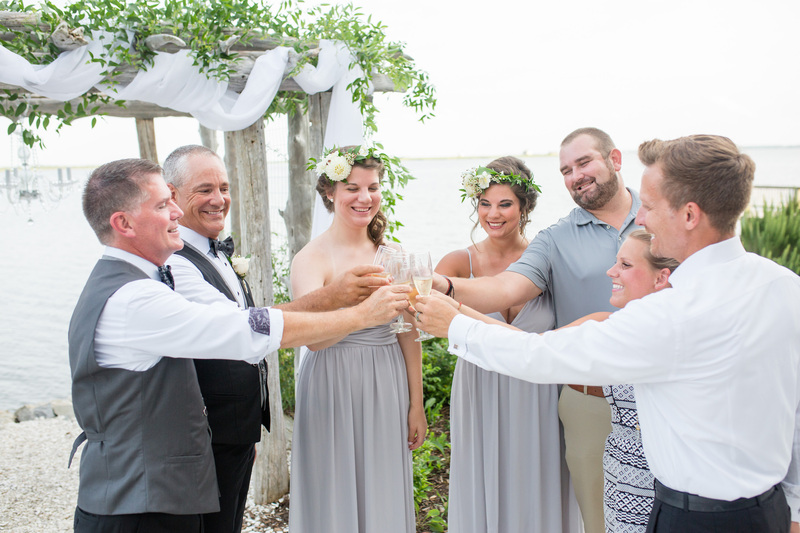 Last July I had the honor of being a part of Jack & Robert’s heartfelt, intimate wedding here on the Outer Banks. Robert’s daughter, Liz, is a great friend of mine and when she asked if I would be able to coordinate the day of course I said yes! I think weddings of all sizes are beautiful, but there’s just something so special about an intimate celebration with just the immediate family. In attendance were the grooms, Robert’s two beautiful daugthers and Liz’s boyfriend. The family got ready at the cozy Oasis Suites before heading to the gorgeous soundfront ceremony site at Basnight’s Lone Cedar Cafe. They already have an incredible waterfront arbor in place, so The Embellishers added some soft draping and I Do OBX Chairs added the chandelier for a glam touch. Tony of I Do OBX Weddings led the sincere ceremony and once it was official, we all toasted with a bottle of champagne to the newlyweds! After the ceremony, Kristi Midgette Photography took advantage of the picturesque setting for some photos before the family switched locations for the reception. The private dinner was hosted al fresco on the soundfront deck at Nags Head Golf Links and we literally could not have asked for a more beautiful night & sunset. The deck was draped in bistro lights for that romantic glow and the decor was the perfect combination of rustic & glam. Renee Landry Events provided the farm table & lighting, while The Embellishers offered the lush white rose centerpieces. I LOVE when there are sentimental pieces included as well so I have to share the story behind the crystal decor on the tables. Robert & Jack are award-winning rose growers – I know, a dream! – and with many of the contests they win come beautiful pieces of crystal as prizes! They brought some of the items to be used on the tables, mixed in with a few simpler items! The rose theme continued with the table runner from Ocean Atlantic Event Rentals and as accents on their gorgeous cake created by Just Desserts! The family exchanged gifts, enjoyed a plated dinner catered by the Nags Head Golf Links team and enjoyed music by Phil Watson Music until after sunset. It was such a joy to be a part of this day!